The Eight of Wands in a Tarot reading could mean that you have been struck by the arrows of love and actively rushing into a situation or making preparations to do so with great expectation that things are going to work out. There is a connection with travel through the open countryside. In the reversed position it could mean the arrows of jealousy with resulting conflicts. Domestic disputes for a married person. Eight of Sceptres – Understanding, Observation, Direction. In the triangle is a peacock feather, symbol of illusion and Maya. This connects with Splendor, the 8th Sephirah, called also the Sphere of Mercury, and said to be the seat of the lower manifestations of Intellect. First decanate of Sagittarius, November 22 to December 1st, ruled by Jupiter. Aspiration, foresight; rapid expression of force, but quickly expended; the acceleration of anything in which the Querant is interested. Also generosity, confidence, freedom. Violence, warfare, rapacity, insolence, theft or robbery. 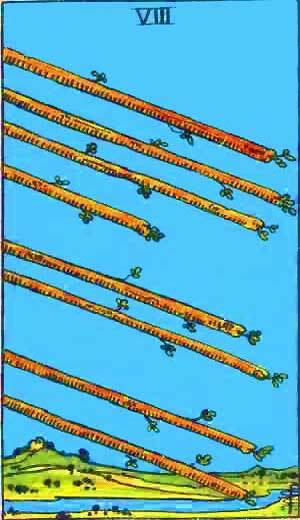 More information on the Eight of Wands Tarot card. This entry was posted in Tarot, Runes and Divination and tagged conflict, consciousness, eight of wands, feelings, jealousy, love, mercury, passion, tarot, wands. Bookmark the permalink.